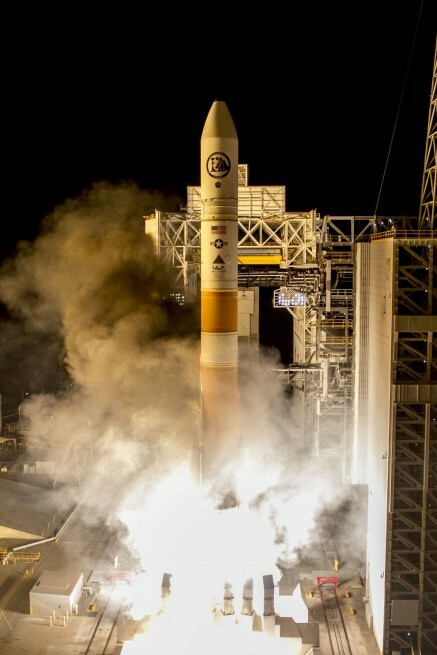 Marking the second flight to depart from the Western Range in 2016, United Launch Alliance (ULA), sent the NROL-45 mission aloft on a ULA Delta IV Medium+ 5,2 rocket on Wednesday, Feb. 10, from Space Launch Complex 6 located at Vandenberg Air Force Base in California. Liftoff occurred at 3:39 a.m. PST (11:00 GMT). Weather conditions at the often-foggy VAFB simply could not have been better, with predictions providing zero percent chances of violating constraints. The same was true for the following day – a day Colorado-based ULA did not need to get the classified payload off the pad at SLC-6 and into the dark skies above. The 5,2 configuration of the Delta IV Medium means that two Orbital ATK Graphite Epoxy Motor (GEM-60) solid rocket boosters were affixed to the booster’s core stage and that the classified payload required a five-meter fairing. In terms of the approving authority for this morning’s launch, it appears that everything went off with limited issues. The National Reconnaissance Office or “NRO”, formed in 1961, is one of 17 U.S. intelligence agencies and is viewed as being among the top five of this grouping. The NRO is based out of Fairfax County, Virginia – just south of Dulles International Airport. The Delta IV rocket is designed to be configurable so as to accommodate payloads of different sizes and weight. Available in the Medium, Medium+ (4,2), Medium+ (5,2), Medium+ (5,4), and Heavy (which is essentially 3 Delta IV Medium Common Core boosters strapped together), it has almost exclusively been used for Department of Defense missions. Launched as part of the U.S. Evolved Expendable Launch Vehicle (EELV) program, the rocket was powered by all-American systems. From the Aerojet Rocketdyne RS-68A engine in its Common Booster Core (CBC), the Aerojet Rocketdyne RL10B-2 engine with the satellite safely secured in the rocket’s 5-meter-diameter composite payload fairing to the two Orbital ATK GEM-60 solid rocket motors that were attached to the exterior of the CBC – the rocket used U.S. propulsive systems. This fact was highlighted by representatives with one of the providers of these systems. Two additional NRO missions are currently on the 2016 launch manifest. At present, a Delta IV Heavy is slated to begin the NROL-37 mission on May 12; again from Vandenberg. Then, on June 14, a ULA Atlas V 421 is scheduled to send the NROL-61 mission to orbit from Cape Canaveral Air Force Station’s Space Launch Complex 41 in Florida. NRO missions are all classified and so next-to-no information about what was sent aloft earlier today. While only the second launch of the year for the aerospace firm, overall it marked the 105th successful flight for the company since it was founded from elements of Boeing and Lockheed Martin in December of 2006.